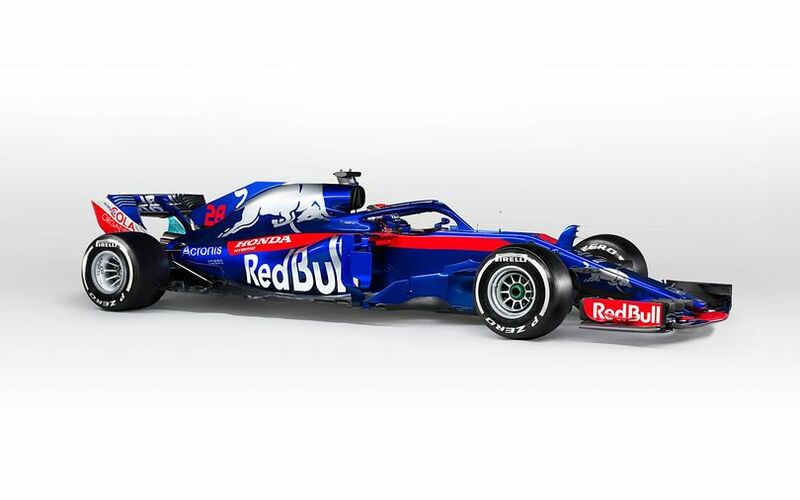 Toro Rosso Honda have taken off the wraps of their new STR13 car, the first one of the team pairing with a Honda power unit after the team secured a works deal with the Japanese engine car manufacturer late last season. Despite the late decision to switch engines, the new car appears surprisingly slick, with a very compact sidepod package and rear end. With James Key still at the helm of the design team, Toro Rosso have opted to change the design philosophy of the nose cone. While maintaining the height of the front bulkhead, and therefore also the steepness of the slope of the nose, the tip is now a thumb style design, whereas previously they went for a Mercedes-like design with a slightly wider and rounded tip. The new layout allows to have the front wing pillars further apart from each other. Other teams - such as McLaren on the MCL32 - have already exploited these positions thoroughly by adding aerodynamic slots into them to inject airflow underneath the nose. The car features the same colour scheme as last year with the Red Bull cola blue and red tones. The halo has therefore also been painted in metallic blue and blends with the car as well a spossible. Further back, the sidepod entries are similar to last year, with the team rejecting to copy Ferrari's design from the Ferrari SF70H, like sister team Red Bull did. An understandable decision nonetheless, as there is little in this area to share with Red Bull Racing, due to STR doing their own aero work in-house, as well as having a completely different engine package on board. The car will immediately hit the track at Barcelona as teams start the first of two 4-day tests at Circuit de Catalunya. Franz Tost, Red Bull Toro Rosso Honda Team Principal: “I am really looking forward to begin this new season and enter a new era for our team, working together with Honda. It’s an exciting time for Toro Rosso because we have not had our own engine supplier before, so to partner with a manufacturer, with the history Honda has, will be great.